When multi award-winning Israeli British food author, Yotam Ottolenghi, opened up Nopi, a far-east-meets-west restaurant marrying Middle Eastern and Asian flavours, in London, he may have seemed a little mad. Miso and molasses, star anise and sumac, wasabi mascarpone… these big, bold flavour combinations have catapulted Nopi into critical acclaim, and with head chef, Ramael Scully, bringing his unique flair into the Ottolenghi kitchen, fans have been unable to resist returning to Nopi, again and again. 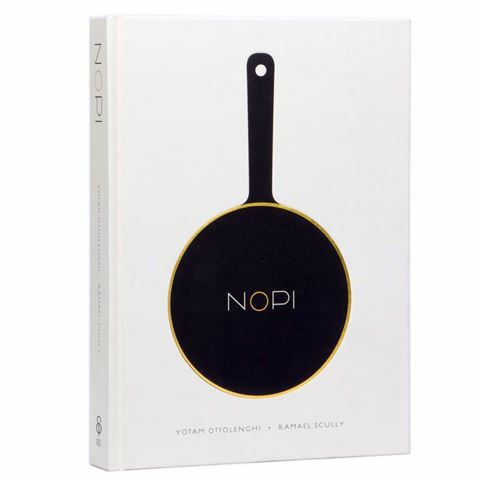 Whether you’re a Nopi regular, or just a regular Ottolenghi fan wishing to indulge in restaurant quality dishes at home, you can bring a bit of Nopi magic into your kitchen, with Nopi: The Cookbook. Offering over 120 of the restaurant’s most popular dishes adapted for home cooking, there are some signature dishes which fans will recognise, like Beef Brisket Croquettes and Persian Love Rice, and others that will surprise, like Soft Shell Crab with Sweet Black Pepper Sauce, Okra and Cinnamon Pickled Cucumber or Five-spiced Tofu with Steamed Eggplant and Cardamom Passata. Even before you start slicing the ginger, watch your knees wobble as you flick through page after page of irresistible colour photography. There’s a chapter to suit every occasion (there's even one wholly dedicated to puddings! ), and with every recipe varying in their degree of complexity to appeal to any level of home cook, your kitchen will be sure to come alive, Nopi style. Divided into Starters, Salads, Sides, Fish, Meat, Vegetables, Brunch, Puddings, Cocktails and Condiments sections. Breathtaking full page colour photographs throughout, including images of the Nopi team.